Materials: Carbon steel, Cr-Mo steel, stainless steel, etc. Accessories: Positioner, limit switch, solenoid valve, etc. For more details, refer to the specification sheet for the individual model. Products can be provided to meet a variety of body material specifications, such as: carbon steel, which is generally used with water, steam, and fuel oil; highly corrosion resistant stainless steel, which is essential for controlling corrosive fluids; and resin. Cage-type single-seat valves with excellent anti-cavitation performance are available for severe service in high temperature and high differential pressure. Control of various fluids is enabled by hardening of the valve interior, self-washing structure (optional), and steam jacketing (optional) to prevent coagulation by keeping the valve body hot. Metal seat tight shutoff (class V) and soft seat tight shutoff (class VI) are available. A bellows seal can be added to valve stems. Increasingly sought-after specifications for gland packings can be applied to comply with fugitive emissions regulations for volatile organic compounds. High control performance is achieved by a combination of wide rangeability and a smart valve positioner. For more details, refer to the specification sheet of each model number. Products can be provided by using different materials for valve stems - e.g., carbon steel is generally used with water, steam, and fuel oil; and high corrosion resistant stainless steel that is essential for controlling corrosive fluids. The excellent anti-cavitation performance of these cage valves plays an essential role in controlling fluids at high temperatures and under high differential pressures. Optional specifications can be applied to reduce aerodynamic noise produced by steam and gas. Metal sheet tight shut (class V) and soft sheet tight shut (class VI) are available. A bellows seal can be added to valve stems. Increasingly sought-after specifications for gland packings can be applied to comply with fugitive emission regulations of volatile organic compounds. The original internal valve structure adopted by azbil essentially eliminated the shortcomings of conventional double-seated control valves that suffered from reversal of fluid reaction force, thereby achieving stable control. Diaphragm control valve in which the trim is lined with chloroprene rubber, glass, PFA, etc. Resin control valve with a body made of rigid PVC or polypropylene. Resin control valve with a body made of PTFE. Control valve with a ceramic body. It is suitable for microflow control. Control valve with a ceramic body. Recirculation control valve for feed pumps of boilers in power plants. Control valve for turbine bypass and auxiliary steam decompression for boilers in power plants. Control valve suitable for bioprocesses that involve cleaning with the hot water washing, steam sterilization, etc. Materials: Cast iron, carbon steel, stainless steel, etc. Angle valves are structured so that the center lines of the entrance and exit of the fluid intersect perpendicularly. In general, the horizontal line is the entrance and the vertical line is the exit. This structure allows the fluids commonly known as slurry (i.e. viscous fluids an d fluids including solid bodies) to pass more easily through the valve, making it suitable for controlling them. Additionally, it prevents the valve from being damaged due to fluid cavitation and flashing, making it suitable for fluids with these conditions. This valve type is mainly adopted to solve problems that are difficult to address with general-purpose valves. Therefore, we can apply various materials (e.g., ceramic and cemented carbide) to the trim parts and its peripheral parts in order to handle special needs. For detailed information, please refer to the spec sheet for the individual model. Three-way valves are used for dividing or mixing fluids. AMT three-way valves can be used for both dividing and mixing fluids. HDT three-way valves are used for dividing fluids. They are typically mounted on heat exchangers to control temperature. when used with the new selection of MagneW3000 PLUS+ detectors. FM/ CSA nonincendive model is suitable for use in Class I / II / III, Division 2, Groups A, B, C, D, F, and G or non-hazardous locations only. General model is suitable for use in non -hazardous locations. AT9000 Advanced Transmitters are smart differential pressure and pressure transmitters equipped with microprocessors for high performance and reliability. 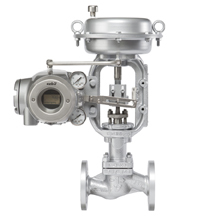 They can measure flow rate, pressure, and fluid levels of gases, liquids, and steam, as well as transmitting 4–20 mA DC analog or digital signals in proportion to the measured pressure. By means of two-way communication between the AT9000 and a CommStaff or HART® communicator, operations such as self-diagnosis, range setting, and zero adjustment can be easily accomplished. Response speed: 100 ms or faster; can be used in applications that require fast response. Zero/span adjustment can be done without opening the cover. Historical data (e.g., on excessive pressures or abnormal temperatures) can be retrieved by a communicator. For measurement of minute pressure changes (tasimetry) in furnaces, etc. For processing lines requiring reliable measurement under strictly controlled conditions of temperature, humidity, etc. For manufacturing lines requiring reliable measurement under strictly controlled conditions of temperature, humidity, etc. The local user interface on the front of the device combines an LCD display and push buttons, and can be used in explosive atmospheres. From the front panel the user can execute the automatic adjustment (Auto Setup) program, check equipment status, and display various parameters. Integration with device management systems can be done using EDDL, DTM, and PLUG-IN Valstaff. The installed control valve diagnosis algorithm effectively applies data obtained from the embedded pressure sensors for measuring supply air pressure, output air pressure 1, output air pressure 2, and nozzle back pressure. Equipped with a splash-proof magnetic switch outside of the explosion-proof enclosure on top of the device in order to run the automatic adjustment (Auto Setup) program, manual span adjustment, and so forth. Comes with a control valve diagnosis algorithm installed. Each positioner is used by mounting the travel detector on the control valve actuator and the positioner itself on a 2-inch pipe or the like. Such features help to extend the product's service life, make maintenance work safer, and enhance workability. Other features are the same as the 300 Series. This smart valve positioner is designed especially for rotary valves (butterfly valves, ball valves, etc.). The design is suited for use in combination with actuators for rotary valves, such as rack and pinion actuators and Scotch-York actuators. Execution of the automatic adjustment (Auto Setup) program, manual span adjustment, and other tasks can be performed using push buttons inside the casing. Designed for Safety Instrumented System (SIS) use, conforms to IEC 61508 Standards, and is SIL2- or SIL3-certified. The local user interface on the front of the device combines an LCD display and push buttons that can be used even in an explosive atmosphere. The following operations can be performed from the interface: automatic adjustment (Auto Setup), check of device status, and Partial Stroke Test (PST). Various input signals (4-20mA, 0-20mA, 0/24VDC) are supported for use with a solenoid valve or for ON/OFF control instead of a solenoid valve. Integration with device management systems is possible with EDDL, DTM, and PLUG-IN Valstaff. The installed control valve diagnosis algorithm effectively applies data obtained from the embedded pressure sensors to measure supply air pressure, output air pressure 1, output air pressure 2, and nozzle back pressure.